In Deficits saved the world you read that a Nobel Prize winner not previously associated with Modern Monetary Theory (MMT) is starting to come round. The article by Paul Krugman highlights some of the basic elements of the sort of macroeconomics that I have been writing about for years and which forms the basis of this blog. It shows definitively the point I make about the macro balances – that a government surplus will squeeze the non-government sector into deficit and vice versa. It also addresses the current policy debate which is getting swamped a bit by idiots who are saying that fiscal policy is not working and should be constrained to get the government budget back into surplus. Paul Krugman’s work in international trade which won him the Nobel Prize is thoroughly orthodox (neo-classical). His work in economic geography hardly could be described as progressive. He was part of the Reagan Administration and also a consultant to Enron before they crashed in a ponzi heap. He has also written articles that advocated wholesale deregulation of the labour market (for example). I also noted in my blog recently – Balance sheet recessions and democracy – that Krugman has not always been a fiscal policy sort of a guy. During the Japanese “lost decade”, he dramatically failed to understand the nature of their problem and recommended a reliance on monetary policy. His prior writings do no suggest that he really understands how a MMT actually functions although it is true that in recent months he has advocated increasing use of fiscal policy. I place him in the deficit-dove camp, which means he doesn’t eschew the use of deficits but still operates largely in a gold standard (convertible currency-fixed exchange rate) mentality. So his latest Op Ed in the New York Times (July 15, 2009) entitled Deficits saved the world is a welcome change. Perhaps things are percolating out there in ideas land as the Modern Monetary Theorists (though small in number) keep hammering out the message. It is clear that we are gaining more circulation via the blogosphere and other network modes that have dramatically increased the capacity of academics to communicate with the world outside our ivory towers. More people read this blog each day than read my academic papers and books that is for sure. As a (relevant) interlude, I was a keynote speaker at a financial markets workshop in St Croix (US Virgin Islands) last year. The event is a bi-annual affair and brings the major investment bank economists (mostly US-based) and related bond traders etc together. It is the second time I have been invited and it gives me a chance to talk at length to (and with) the characters that are moving the billions around – “the wealth shufflers” (as I call them). The organiser, who is a big player in the bond markets but also a strong advocate of MMT uses the meeting to spread the word to the rest of his profession. It is a good strategy. Forget the academic economists who largely refuse to engage and, instead, get the ideas directly into the financial market traders, managers and analysts. At the last meeting in January 2008, the Chief Economist of Goldman Sachs Jan Hatzius was one of the attendees. What his reactions (in terms of theory) were to ideas presented during the two days of workshops is unknown to me. I got the impression from the workshop that he was not antagonistic and clearly he was smart enough to get the major points being made each day about how a fiat monetary system operates and the implications of that for fiscal policy managing the economy when private sector agents do not want to spend all their income. The private sector financial balance – defined as the difference between private saving and private investment, or equivalently between private income and private spending – has risen from -3.6% of GDP in the 2006Q3 to +5.6% in 2009Q1. This 8.2% of GDP adjustment is already by far the biggest in postwar history and is in fact bigger than the increase seen in the early 1930s. That’s an interesting way to think about what has happened – and it also suggests a startling conclusion: namely, government deficits, mainly the result of automatic stabilizers rather than discretionary policy, are the only thing that has saved us from a second Great Depression. Krugman then offers the following diagram. The diagram is a little ambiguous as it stands. It depicts the private and public balances. To understand it, note that the vertical axis is the state of the balance so for the private sector and depicts a surplus above zero and a deficit below zero. For the public sector it depicts a deficit above the zero line and a surplus below it. The horizontal axis is GDP (level of activity). The upward sloping private sector balance reflects the fact that savings are a function of GDP and so when economic growth is strong, saving rises (not all the growing income is spent). The downward sloping public deficit line reflects the automatic stabilisers – such that when GDP falls, tax revenue falls and spending on unemployment benefits (and other welfare-related items) rises. As a consequence, without any discretionary change in fiscal policy being made, the public budget balance will move towards deficit (or higher deficits) depending on where it started from. That is an upward movement along that line. In equilibrium the private surplus equals the government deficit (not strictly true for any one country if you add in international capital flows, but think of this as a picture for the world economy). To make the figure cleaner I’ve shown an initial position of balance in both sectors, but this isn’t important. What this means in MMT terminology is that the government balance will always equal the opposite of the non-government sector (can be construed in this diagram as the private sector for simplicity) balance – $-for-$. So if the government sector is in deficit then the non-government sector is in surplus (net saving) and vice-versa. In a behavioural sense, the income adjustments (that is, movements in GDP) will ensure the two balances conform to this accounting requirement. Krugman has fudged the diagram a bit (as he notes “to make the figure cleaner”) by constructing the initial equilibrium as a point where both sectors are in balance. That is, there is a balanced budget and the non-government sector has no saving (they are spending all they are earning). It is an unrealistic starting point and I will come back to it soon. But for now we can work with this as a starting point because it serves to make the point nicely. So the shift upwards that is depicted in the upward sloping private balance captures this “autonomous” shift in the curve. Economists talk about movements along a curve and shifts in the curve. The movement along depicts the functional relationship between private saving and GDP and shifts in the curve happen when behaviour changes (so saving at every level of GDP is higher). The impact of this shift is clear. 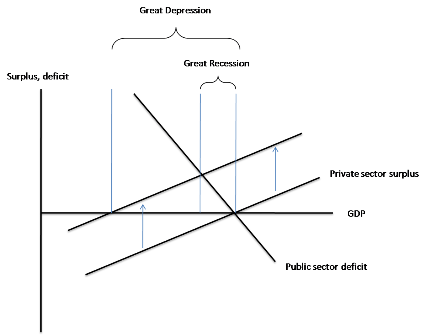 The new equilibrium which is established by shifts in GDP occurs when the two lines (the new private balance line) and the public balance (budget deficit) line intersect. You can see that this occurs at lower levels of income because the fall in aggregate demand (from the rising saving) also drives the public budget into deficit (assuming this artificial starting point of perfect balance in both the government and non-government sectors). So what he is saying (and he is being simple for ease of exposition by assuming there is no public sector of note) is that once there was a behavioural shift towards high saving preferences (driven by pessimism etc), which is denoted by the shift in the private (non-government) sector balance, then GDP starts to fall. So there you have it … the deficits provided the spending impulse that served to “finance” the increased desire to save by the non-government sector and without the automatic stabilisers the situation would have been much worse. I reconstructed the diagram to allow you think more about where we started this crisis from and where we need to head. The following diagram can be interpreted in the same way as Krugman’s except it has some additional features. First, note I have now specified the full employment level in the economy. GDP has to be at this level, given labour productivity to generate enough employment to satisfy the preferences of the available workforce. Second, Point A is where we started this crisis from. Output (GDP) is deficient because it is below that required to generate full employment. So at Point A there is some unemployment (we started with 3.9 per cent) and underemployment (we started with 5.7 per cent). Note that the government budget balance is in surplus and the non-government sector is in deficit at Point A. This is where the economy is at rest. Aggregate demand is not sufficient to support full employment. The only way the economy is growing at all is that the non-government sector is in deficit (growing indebtedness) because the government sector (running surpluses) is in net terms contracting demand at each point in time. Third, now the non-government sector seeks to restructure their precarious balance sheets because at Point A they were highly indebted (been forced into deficit by the budget surpluses) and so they change their behaviour and start increasing their desired saving at every level of income (GDP). So the private balance line shifts upwards to the red line (say). As aggregate demand falls (because saving rises), firms start laying off workers and cutting hours or work as they reduce output (GDP) to match the declining levels of demand. The economy shifts up the red arrow and will settle eventually at the new Point B where the budget balance (now in deficit) equals $-for-$ the non-government balance (now in surplus). The automatic stabilisers are depicted by the movement along the budget balance because at this stage there has been no stimulus package (discretionary change in fiscal policy). This budget deficit is what I call a “bad deficit” because it has arisen through the automatic stabilisers and represents a failure of the government to act to support high employment levels. You can see we are now further away from full employment than before but the plunge in demand is arrested by the operation of the automatic stabilisers. If nothing else happened (policy wise or private sector behaviour wise) the economy would sit at B forever and we would endure a prolonged recession. Fourth, discretionary fiscal policy changes are depicted by shifts in the public balance line. So an expansionary fiscal stimulus package will shift the line out to the right because it means the budget balance = 0 point will be associated higher levels of income (higher taxes can support higher spending and still get a balance = 0). Now look at Point C (which is green because I only ever advocate expansionary measures that satisfy our other needs for environmentally sustainable growth). An expansionary stimulus package (that is, explicit new measures designed to increase net government spending) will move the economy along the red saving line via the blue arrow. How large the stimulus package is determines how far GDP will increase and how close you get to full employment. Note that the private balance line cuts the full employment (green) line at Point C. This means that at higher levels of activity (GDP) the private surplus will be bigger because saving rises with income. People don’t spend all of their increasing income. 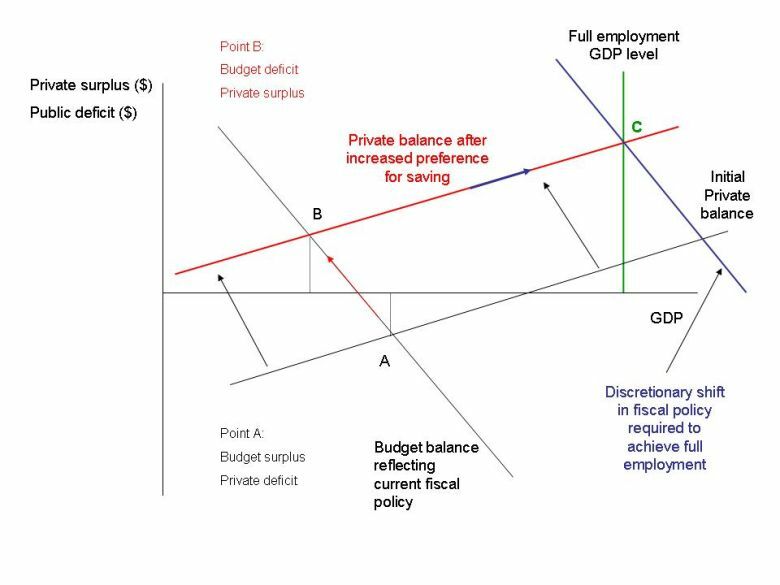 So to get full employment, discretionary fiscal policy has to stimulate aggregate demand sufficiently to support GDP levels at Point C which will also generate increases in saving. In this case, the rising saving is not destructive because the fiscal policy is filling the “spending gap”. The increasing budget deficits as the economy expands are “good deficits” because they support (“finance”) the increased saving and the rising income levels that generate that saving. Fiscal policy should not expand beyond Point C because then GDP > capacity (or potential GDP) and inflation will result. Up to Point C, it is highly unlikely that inflation will be a problem although some sectors might experience cost pressures. Specific asset price bubbles might also arise but that is not inflation and can be dealt with in a way that does not compromise the policy goal of full employment. So a Nobel Prize winner is now thinking in terms of sectoral balances which are a basic analytical construct used by Modern Monetary Theorists like me to understand what is going on in the economy and what should be done about it. In terms of the second diagram, imagine what would happen if the debt-deficit hysteria conned the government into cutting discretionary net spending. The fiscal balance line would shift to the left of Point B and GDP would plunge further and the saving intentions of the private sector would be thwarted by the falling output (income) levels. Then if the private sector tried once again to increase their saving ratio (Saving to GDP) the private balance line would shift further to the left and a major depression would be heading our way. The analysis shows that automatic stabilisers put a floor in the decline after the non-government sector resumes saving. The deficits that arise are generated purely as a result of the cycle. But to restore full employment would require discretionary expansion in fiscal policy. You can also see that starting off from Point A, the economy had to go back into deficit to get back to full employment even with the previous saving preferences of the non-government sector (that is, moving along the initial private balance line). An expansion at that time would have also pushed the private sector back into surplus with lower public deficits being required (because the desired private saving ratio would have been lower). Either way, whenever the non-government sector desires to net save the government has to be in deficit. The choice then is whether we have “good” or “bad” deficits. Good sounds better to me every time! Krugman is another Academic come part-time journalist more concerned with making noise than he is of saying or doing anything of substance. One only needs to read his analysis of the Asian Financial Crisis via the auspices of a Keynesian Liquidity Trap to see that he’s been off his trolley for many years. Jan Kregal (2000) for example was critical of Krugman’s approach. Without going into too much detail Kregal bascially said that Krugman didn’t know the difference between a Liquidity Trap and insuffiecent aggregate demand . Given Krugman always thinking in terms of the Hicksian IS-LL model he’s pretty much doomed from beginning to end because it’s pointless discussing the dynamics of inflation with a comparative static model – not to mention how IS-LL is conceived exclusively (though mysteriously) in real terms – which further leads to the blatant determinism of the Neo-Classicals most of us avoid like the plague. This latest piece by Krugman does little to change my opinion. Not that my opinion means too much these days (if ever) but I’d rate Kregal and yourself as being light years ahead of Krugman. Hence I’d be distancing myself from Krugman Clark medalist / Pseudo Nobel winner or not. J. A. Kregel, 2000. “Krugman on the liquidity trap: why inflation won’t bring recovery in Japan,” Economia, ANPEC – Associação Nacional dos Centros de Pósgraduação em Economia [Brazilian Association of Graduate Programs in Economics], vol. 1(1), pages 39-58, January-J. Increasing G – T does not decrease I. That is a very silly conclusion and leads to the paradox of thrift. Because loans create deposits, investments create savngs. The causality runs – I changes S and not S changing I. If “I” stays constant, then S increases just because the increase in G – T.
Correction. Your diagram is really good. I found Krugman’s graph too boring. We all should be very careful trying to explain dynamics within a comparative static framework. I am not sure I 100% understand this model yet. It has really captured my attention. So what it is saying is when private savings preferences (determined by?) increase the solution is to either run a government deficit to maintain full employment GDP (Where is full employment GDP? Neutrality of money? Why not full employment?). Should government run a deficit, this period, they’d have to borrow from foreigners (current account deficit) or from people at home with savings, in exchange for repayment+interest which can be paid for by printing money, taxes, or more deficits. Either way, these debt servicing requirements could be a large chunk of government budgets, which could transfer purchasing power from the economy as a whole to the holders of government bonds. Government bonds don’t create net wealth, unless spent on projects that could increase the productivity of the economy. This seems like a drawback, especially if a major percent of buying power belongs to foreigners. Exports are a cost. The last thing I have yet to understand is how are the slopes of the lines determined? Wouldn’t a major productivity boost also take the economy into full employment territory fast? A fixed banking sector has to do a lot of good for the economy. Keep up the good work Billy, and try not to be so harsh with your insults on economists who don’t get it.. yet. I think it odd that a person say they do understand 100 per cent of the model yet and then start launching into statements that have no bearing on the modern monetary model (or relevance really) but instead just resemble standard gold standard text book analysis. Why not really try to understand my analysis from first principles first then see where you are at with the other stuff? Then we can have a nice discussion if you are still unconvinced and can demonstrate the logic of your concerns. So statements such as “Should government run a deficit, this period, they’d have to borrow from foreigners” is just plain wrong. Should a government run a deficit this period suggests nothing at all about their monetary operations with respect to borrowing. They don’t have to borrow from anyone! Bill, I appreciate your response greatly. Please don’t take my statements/questions as an effort to debunk your insights, but rather my most efficient learning style is to picture a story in my mind. Peter Temin and Berry Eichengreen are masters at explaining things in a way I can understand: [http://www.docstoc.com/docs/document-preview.aspx?doc_id=3629040]. After three years of college economics I still am keenly aware I know just enough to be dangerous. Rather then start from scratch I’m looking for economists who don’t base their theories on thousands of false assumptions and instead derive it from empirical evidence. I am sure that you can sympathize with this dilemma. The careful contemporary economists I’ve discovered so far are you, Scott Fullwiler, Richard Werner, Geoffrey Ingham, Steven Keen, and Robert Schiller. How do you determine full employment GDP? What determines the slopes (and shapes) of those lines? Current account balance could be pro or counter cyclical right? Japan’s GDP increased by an export lead current account surplus? I DID point out the option of government paying for increased spending by printing money! Could you give examples of “good” and “bad” government deficits and why they are that? Lastly, when government pays interest on debt held by foreigners, isn’t it a possible outcome that domestic consumption demand will become small relative to demand for exports? Thank you for clarifying my thoughts, it’s GREATLY appreciated.